Before doing these sunrise hiking elopement photos for Erica and Zac, I first did their engagement photos in Boulder last fall, then photographed their destination elopement in the fjords of Norway! Since we had a full day of torrential downpour and crazy weather in Norway, we were very limited on how many photos we were able to do that day during the few breaks from the rain. So after Erica and Zac returned from their destination elopement and following vacation, we decided to get together for sunrise hiking elopement photos on one of my favorite trails. What’s funny is that I remember talking to Zac while we were in Norway about how he doesn’t think the mountains in Colorado are all that pretty, because they’re usually just grayish brown and bare, with so much of the mountains being above the tree line. When we met that morning in a dark parking lot, we slowly started hiking our way away from the road. As we got closer to sunrise, the mountains started lighting up with the most beautiful pink and orange alpenglow. I personally think Colorado looks pretty damn good any time of day, but there’s something extra special about a sunrise hiking elopement. When there are no other people around, it’s drop dead quiet, just you and the mountains, and those colors start coming out – there’s nothing like it! 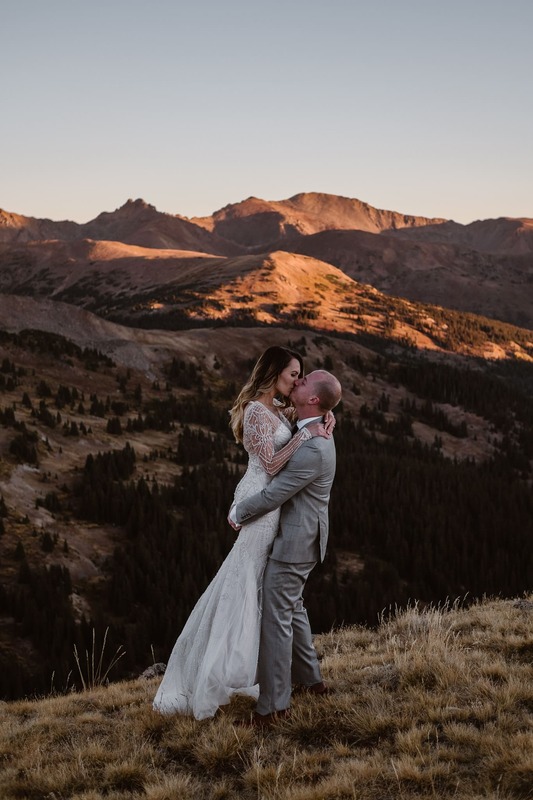 If you want to elope in the Colorado mountains, whether you envision a sunrise hiking elopement or a more traditional mountain elopement (is that even a thing? 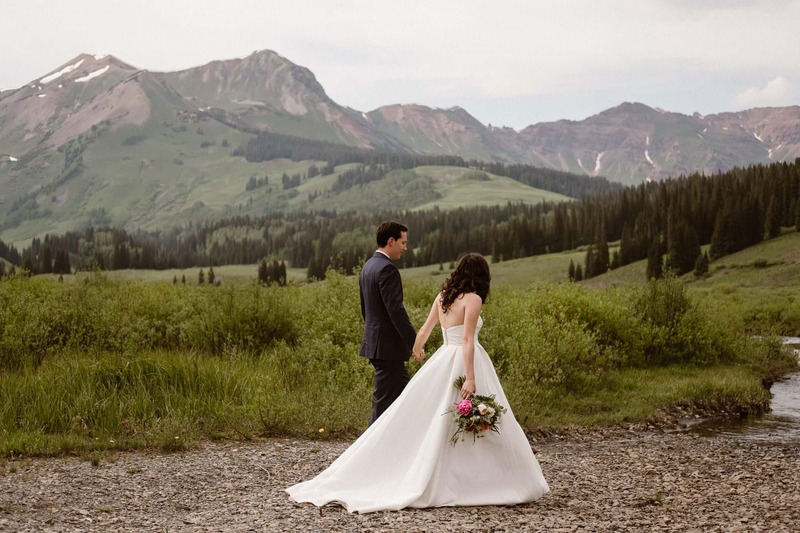 ), I would love to help you find the perfect mountain views and capture the big day! Reach out via my contact form and let’s chat! 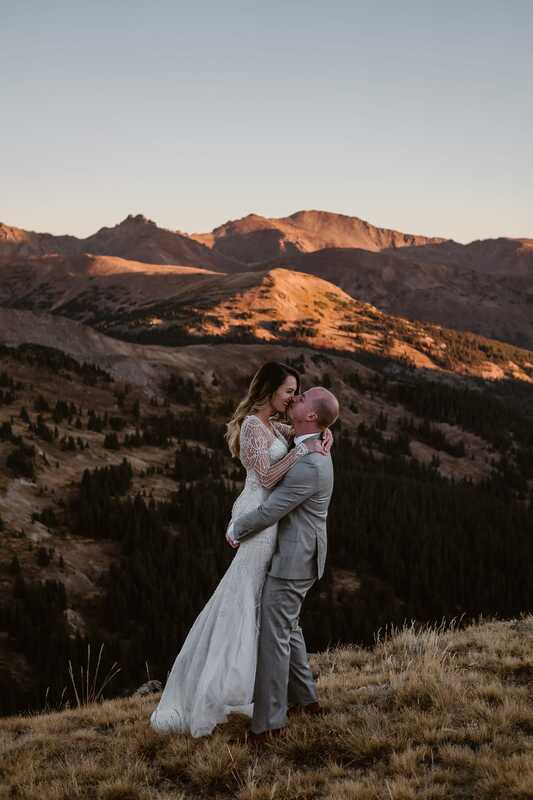 I’ll close out this post with a snippet from the wonderful review Erica left me after their sunrise hiking elopement photos! Yes its difficult to just bite that bullet of paying for a photographer that is “more expensive” than another. But Nina’s work is leagues above many other photographers. We decided that we were paying for her destination collection so that she would be our photographer in Norway. And since we had another family wedding in Michigan, we could find someone local for that to save. If you think you should find the cheapest photographer you can find, stop. YOU GET WHAT YOU PAY FOR. Since we went with a company based photographer who was less expensive in Michigan, i saw the difference. I saw the things that Nina paid attention to and helped change that our Michigan photographer didn’t. I regret not asking if Nina would also be our photographer for Michigan. Thank you, Nina. You are incredible. P.S. Erica’s beautiful wedding dress is by Justin Alexander, and was purchased at The Bridal Collection in Denver!